Includes: Blade guard, 4 guides, oil and cleaning brush. 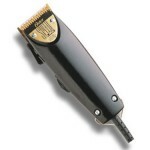 Quick detachable clipper blade design. Adjustable blade from size 000 to 1. Low profile cutting blade lets hair flow through easily.